I was at my parents house this afternoon and Food Network was on because, well, who doesn't love to watching cooking shows?! My dad made the comment that he really likes Ina Garten (Barefoot Contessa), and I agreed. We can all guess that Chris' favorite chef is Paula Deen (anyone who fries that much food and cooks with that much butter is like kin to him!). So who is your fave? Rachel Ray? She's a tad peppy for me! Paula? Love her gooey butter cakes, but I can't cook too much of her food! It's like a heart attack on a plate! Ina? My fave. I would LOVE to meet her! Giada? I cook a lot of her food, and I always liked her until she was a guest judge on Who Wants to be the Next FN Star. She was so mean to the contestants! It really changes my opinion on her. And for all those who asked, my mom got B's chair through Pottery Barn Kids - and it is the infant one. She said they are also available for toddlers! I actually love to watch Sunny Anderson. Especially when im at the gym, Why must I torture myself? haha But seriously foodnetwork is amazing! I have gotten great recipes off of there. on Ina all the way. Rachel drives me nuts with the peppy talk and chatting with her hands. I used to love Giada too but she just doesn't seem very personal. I love how Ina always has her friends around and she's very smart as well....working at the White House at one time! Ina & Giada are my faves!! I love Ina Garten. I met her in person when I went to a book signing of hers. She was just as nice and gracious as she appears on her show. I own all of her cookbooks and her recipes are great!! I absolutely love Guy!! So cute! :) And I love the Neely's... but i enjoy watching Ina, she seems very personable! im a gorden ramsey gurl. i would love 2 eat at one of his restrants and go 2 hells kitchen. My fav is Paula Deen and Ina Garter. Also love The Neeley's. I love Rachel Ray. She is so cute and while she is pretty peppy she is really fun to watch. I also like Paula alot. We are going to Savannah after Christmas and eating at her resteraunt is a must on my to do list while we're there. I'm a Rachael Ray girl - yeah, sometimes she's a litte too energetic or giddy about things, but I love it! 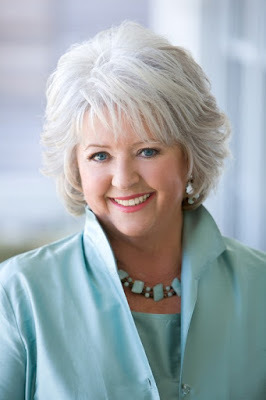 I have made LOTS of her recipes and just really enjoy her, her shows and her magazine! I love the Food Network...not too many I really can't stand. I could watch it all day long! I understand why people say Rachael is too peppy for them but I like her. She makes things fun. I think Ina and especially Giada are so BORING!!!! Paula seems too fake for me. I don't watch cooking shows a lot, but if I do, it's Rachael. I would defiantly say Ina, I just love her and all of her food. Her chicken salad recipe is the best. However the cuteness factor I would have to go with Tyler Florence. One of my husband’s flight attendants on a trip he was on takes pictures of food for the FN sometimes and she said that Ina and Tyler Florence are so nice and sweet, what you see is what you get kind of people. It truly is a toss up on who I like more, I think that the ultimate would be to cook with both of them. I LOVE Ina!!!! But she does make some fru fru stuff I wouldn't eat. I think my new fave is Melissa that just won the next food network star. Much more family friendly...plus Giada has got to put on some clothes so I can watch in the same room with hubby and teenage boys! Racheal Ray, Sandra Lee and Ingrid Hoffman are my favorites. Either Alton Brown or Anthony Bourdain. I think Paula is absolutely hillarious, and you're right, she LOVES that butter. How about refried butter dipped in butter with a butter coulis on a plate made of butter? My son is in love with Giada, and even noticed when she's in a new kitchen. Too funny. Ina is too..hmm....mellow for me. Rachel is a little flighty, but her meals are family oriented and easy to make. Ina is my ABSOLUTE FAV!!! Have everyone of her cookbooks and read them over and over. She is pure class and elegance!!! I cannot deal with Rachel and her "cutsy" sayings and Giada...hmmm...just a tad too fake for me! Ina is the superstar!! I love reading your blog...and that little baby B is too cute!!! I learned about your blog thru Kelly's Korner....glad both your angels are healthy, happy and absolutely precious!!! I do NOT like Rachael Ray. Like I can't even stand her short commercial for dog food. Her voice grates on my nerves. 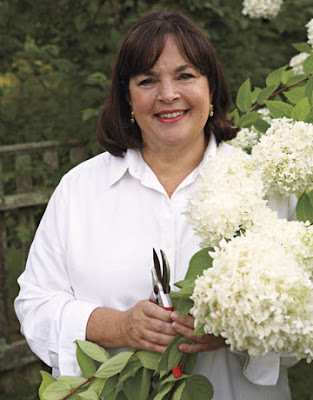 But I LOVE LOVE LOVE Ina Garten. She's so my favorite. She cooks the best food ever! I also like Tyler Florence from Tyler's Ultimate. And of course there's Bobby Flay too -- he's fabulous. And dreamy. For me, it's a tie between Rachael Ray and Giada. 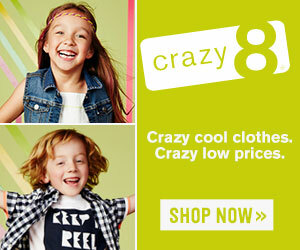 I love their enthusiasm! I love Ina. I subscribe to Rachael's magazine however I'm not big on many of her recipes. Ina's however...haven't found one I don't like. Hmmm...but I also love Paula. Maybe they're all my favorite.Haha. I am sad to hear that Giada was mean to people. I love her!!!! I must admit, I do love Paula, too! All her recipes are yummy! What's not to love when it is loaded with butter!